Ultrasound elastography is based on the comparison of ultrasound images, when the tissue is forcefully compressed. The principle behind ultrasound elastography is to characterize the soft biological tissues using the latest ultrasound technology to obtain a sequence of images which are processed for the ultrasound elastography. In the first step, motion estimation between two or more images is processed. The estimated displacement offers the possibility of obtaining detailed bend elastograms (images of tissue strain). A tumor or a suspicious cancerous growth is normally 5-28 times stiffer than the background of normal soft tissue. When a mechanical compression or vibration is applied, the tumor deforms less than the surrounding tissue. Therefore, the presence of a hard inclusion simulating a tumor of pathological tissue, within a phantom mimicking soft tissue, can be more easily identified which likely leads to an earlier cancer diagnosis. Elastograms have been shown to be affected by the degree of adherence of the tumor to its surroundings, indicating a potential to broaden elastography usage to tumor mobility characterization to improve diagnostic accuracy and surgical guidance. Ultrasonic imaging is the most common medical imaging technique for producing elastograms. Investigations have been conducted using magnetic resonance elastography (MRE) and computed tomography. Nevertheless, ultrasound elastography has the advantages of being cheaper, faster and more portable than other imaging techniques. 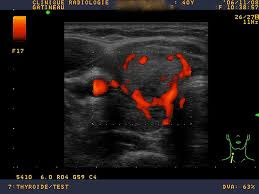 Ultrasound elastography has become an efficient and easy-to-perform component of the breast ultrasound examination as tissue stiffness determinations of various types have been included in a number of high-resolution linear transducers. Ultrasound elastography imaging performed during breast ultrasound is extremely helpful in evaluating breast lesions and selecting patients who need a biopsy, according to current research. It is non-invasive, it is quick and there is no radiation involved. Ultrasound elastography helps distinguish between cancerous and benign breast lesions, which reduce unnecessary biopsies. The technique involves pressing on the breast with an ultrasound probe to measure the firmness or resistance of the underlying tissue. Diagnostic ultrasound elastography can be performed at the same time as hand-held ultrasound and images can be viewed on a split screen, with the two-dimensional ultrasound image on the left and the ultrasound elastography image on the right. A cancerous area will be stiffer than the surrounding tissue, as determined by the ultrasound elastography. Using ultrasound elastography helps reduce unnecessary biopsies, as well as catching early cancers that may not have been otherwise detected. MedWOW, the multilingual, global medical equipment portal specializes in providing a safe and secure environment for key players in the industry to conduct trade, as well as procuring support services. MedWOW currently represents more than 3, 300 complete diagnostic ultrasound systems in inventory, as well as nearly 9,000 parts and accessories. These ultrasound units, when paired with simple add-on elastography units, can provide medical facilities with an excellent diagnostic tool. It is also possible to post a buying request on MedWOW’s to search for a new or used dedicated ultrasound elastography unit.